Fernox, the global water treatment and filter manufacturer, has been rewarded with CIPHE approved training centre status by CIPHE president, Paul Williams. This follows a £1.5m investment in its new training and technical and research facility, with three state-of-the-art product specific and demonstration laboratories. The investment follows the company’s relocation, close to its previous site in Woking, Surrey. The new facilities will further enhance technical services at Fernox and play an important role in the expansion of its product portfolio. Integral to the investment is the creation of two new laboratories, which allow for specific research into the company’s two main product areas: chemical water treatment and filter technology. The chemical laboratory is approved for BuildCert testing, which means the company’s qualified professionals are certified to carry out high standards of product trials, such as corrosion and compatibility testing. The laboratory also includes a formulation bench for creating and testing new formulations. Meanwhile, the second laboratory is dedicated to the development of domestic and commercial filter products. The facility allows the specialist team to perform pressure testing and analyse various methods of filtration, which will effectively collect sludge, scale and harmful debris found within central heating systems. 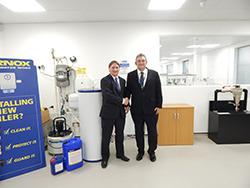 Underlining its commitment to education and training, the head office is also home to a training room, which gives installers of all experience levels the opportunity to learn about the benefits of chemical water treatment and filter technology, understand the regulatory requirements and best practice and gain valuable hands-on guidance and experience. The facility also enables the team to demonstrate how to powerflush a system and dose through underfloor heating systems or radiators. The new training centre has been recognised for its excellence and high standard of training by the Chartered Institute of Plumbing and Heating Engineering (CIPHE) and awarded Approved Training Centre status. The official unveiling of the CIPHE Approved Training Centre plaque coincided with a visit to the training centre by CIPHE president, Paul Williams. Acknowledging the efforts of the training facility in supporting raising standards within the plumbing and heating sector, Fernox joins leading CIPHE approved manufacturers and educational facilities in striving for best practice and innovation within the sector.